Since the early 70's when Husband Jim gifted me with two Waterford water goblets one Christmas, I have had a love affair with Waterford crystal. Over the years, those two water goblets grew to 8, I added wine glasses, sherries and cordials, two brandy snifters are in the sunroom for a nightly nip if we want, six old fashioneds serve Whisky in style, a pitcher, a bowl, several decanters, and then there is the dressing table Waterford and with a ring holder, three perfume bottles and two powder jars, at times Linderhof does sparkle!!! It's the old Waterford before they created the Marquis line -- all made in Ireland and all hand blown and hand cut. Sometime, although I can't remember where, we bought a biscuit barrel. And for the last few years, it's lived in a corner of the Asian cabinet for I couldn't figure out where to put it! Two weeks ago I wandered East to have lunch with Friend Shirley Ann. After lunch we stopped at the Flea Market west of town and among the treasures was a biscuit barrel. I thought it was Waterford -- a twin to the one that was in the back of the cabinet. And the price? $12.99. Did I buy it -- no. Why -- I'm not sure other than the one I already owned was in the back of the Asian cabinet! Friday, Friend Shirley Ann and I agreed to get together once again for lunch and I decided that I would come east once again and buy that Waterford biscuit barrel. To make sure what it was, I got out my biscuit barrel and brought it with me. On the way over, I thought I wouldn't stop and get it, then I would, then I wouldn't . . .the one I had, after all, had lived in the back of the Asian cabinet for a while. What would I do with another! But it was only $12.99 . . . .
And then I decided where to put it -- not only it but the one I already owned. So then, when I stopped, my heart was pounding -- would it still be there? And it was!!! For $12.99 I got a Waterford biscuit barrel. That's the good thing about Flea Markets -- every once in a while you find a true treasure!!!! It is a twin -- or as much a twin as something that is handmade can be! The old one is on the left -- complete with dust (I didn't clean it up because I wanted to be able to tell them apart) while the new one is on the right! Can you tell a difference? And where did I decide to put them? In the upstairs bath -- of course!!!! 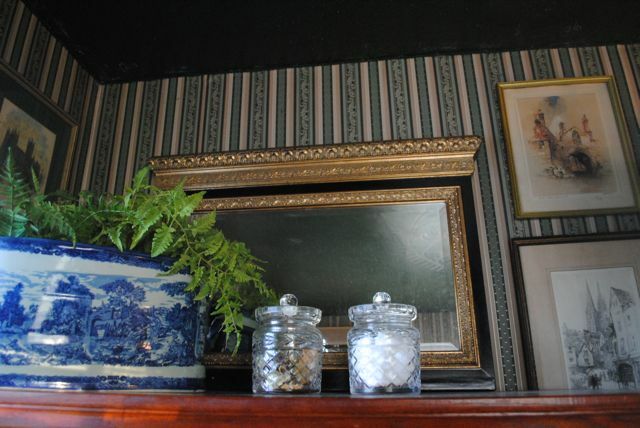 On top of the cabinet -- in front of a mirror with cotton balls in one and potpourri in the other. They add a sparkle that the bathroom lacked! What is really interesting is that the same booth had an Irish crystal vase which was nice but not on the quality of Waterford and it was priced almost 4 times what the biscuit barrel was priced at -- but that's flea markets. And that is the reason we go -- those of us who like old things -- for we thrive for bargains like that! It's Tuesday and I'm joining Marty at A Stroll Thru Life for Tabletop Thursday -- mine is really a "chest" top but . . . Sometimes the stars (or crystals) are aligned just right. I love that you are actually using and enjoying these treasures. 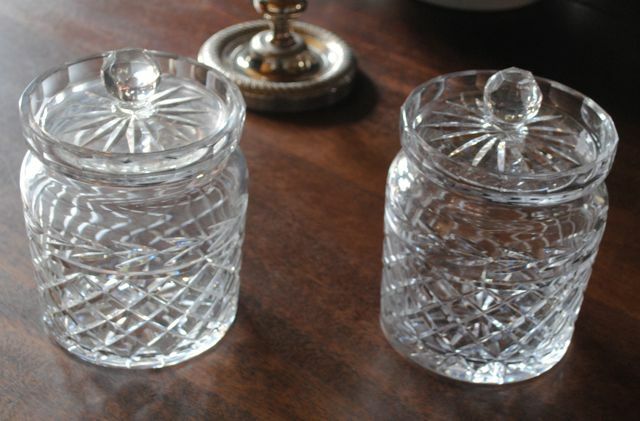 I'm completely jealous when it comes to your biscuit jars. They're wonderful and you'll be able to use them in so many ways. Congrats! Wow what a fabulous find! I'm glad you went back and bought the twin. They look happy together. What a great find. You were so lucky that the biscuit barrel was still there when you returned. They look so lovely in the bathroom, and I know you'll smile each time you see them!. (Sometimes, I've dithered and left something in the shop but it's gone when I return). WoW! What a find. . .a twin to the one you already own! You have a great eye for finding items to continue to enhance Linderhof. I saw something that really caught my eye this last trip that "Mr. Ed" and I made to the Antique Mall. Like you, I didn't make the purchase, yet. We'll see! If they're still there when we return, I'll probably make the purchase. . .one never knows! Thanks for sharing your newest jem with us! What fun! I understand the 'I'll get, I won't get it' confusion. The thrill of the chase if what makes flea markets so attractive. Martha, what a GREAT story! This is indeed the fun of flea markets. And I love how you've used your biscuit barrels, repurposing them to make them useful as well as beautiful. Personally I think just about every room needs a little sparkle and putting the Waterford in front of the mirror will double the effect. I've been seeing you and Carolyn participate in Tabletop Tuesday for quite a while now and today joined in myself for the first time. What a fun blog party. I have one, but its not Waterford. But it is cut crystal. I have always kept it in my master bath with my Q-tips. My Mother gave it to me a long time ago and I really cherish it. It really does add a sparkle to the room! What a great find you got! what a great find. I have waterford and love it, but no good buys like yours! how fun! That's what your biscuit barrell was waiting for....a partner! Love the way you're using them. A pretty treasure for your bath. How lovely. I didn't know they were called biscuit barrels. I will have to look but I think I have a jam jar. A man I met once who was a very serious collector of George Washington-related items gave me great advice. He said if you see something like that, something rare that you want, get it, or years later you're likely to regret not having gotten it when you had the chance. Your biscuit barrel was quite a find, Martha. You've assembled quite a museum just by finding things you really like!